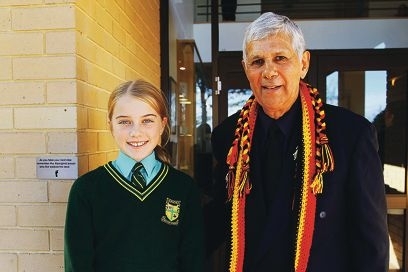 Junior School Captain Stephanie Schwab (Year 6) with Robert Isaacs. Year 6 teacher Sue Neale said the girls had been learning about the development of Australia as a nation and exploring the experiences of Australian democracy and citizenship, including the rights and status of specific groups of people. ‘Students learned that in the early 20th century, Aboriginal Australians did not have equal rights with other Australians and that their lives were controlled by their state or territory government,’ she said. ‘Students were taught how ‘protection’ and ‘assimilation’ policies affected the lives of Aboriginal Australians. Principal Meg Melville said the college had been honoured to host Mr Isaacs. ‘Robert Isaacs is widely and highly respected in Western Australia for his outstanding commitment to breaking down cultural barriers and improving the lives of disadvantaged people,’ she said.